Brock Lesnar’s stint in the Ultimate Fighting Championship is officially over. After getting knocked out by Alistair Overeem in the first round of their colossal encounter on December 30th, Lesnar has decided to step away from Mixed Martial Arts and retire from the sport. For the last 2 1/2 years, Lesnar has been dealing with a lower-intestinal ailment that almost cost him his life. 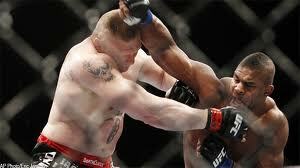 It didn’t surprise me at all when Overeem started to target Lesnar’s stomach during their bout. If you know of an opponents weakness, whether it be in their skill-set or a physical weakness, you have to target it. That’s what Overeem did and that’s why he emerged victorious. Lesnar announced after the fight that he was going to step away from the UFC, call it a career and begin to spend more time with his family. While I am sad to see Lesnar end his UFC career, the decision to retire from the sport was the right one. We as fans sometimes take for granted what fighters have to go through to compete at the highest level possible. We may want Lesnar to stay with the company and compete for years and years and years, but his health and family outweigh anything that we may want. You could tell during his last 2 fights with Overeem and Velasquez that Lesnar was not the same fighter that he once was. The diverticulitis that he had been fighting for 2 years obviously had taken a great deal out of him. He may never have been able to get back to the fighter that was dominating guys like Frank Mir, Randy Couture and Shane Carwin. It’s best to leave while you still have your health and can spend more time with your wife and child. The decision by Lesnar to retire definitely leaves Dana White and the UFC in a hard place. Lesnar was a huge pay per view draw for the company and brought a lot of mainstream attention to the sport. Whenever Brock fought, the event was made to be more of a big deal because he was on the card. With Lesnar gone and Welterweight Champion George St-Pierre on the shelf for the foreseeable future, the UFC is now without 2 of its top draws. The company still has guys like Jon Jones, Anderson Silva, Frankie Edgar and Junior Dos Santos to pick up the slack and draw money, but losing a guy as popular and well-renowned as Brock Lesnar will hurt. As soon as Lesnar announced to the world that he was leaving the UFC, the internet started getting flooded with rumors that Brock Lesnar could be making a return to the company that made him the star that he is in the first place; the WWE. The man wasn’t even retired for 24 hours before people started to speculate about the former “Next Big Thing” returning to professional wrestling. 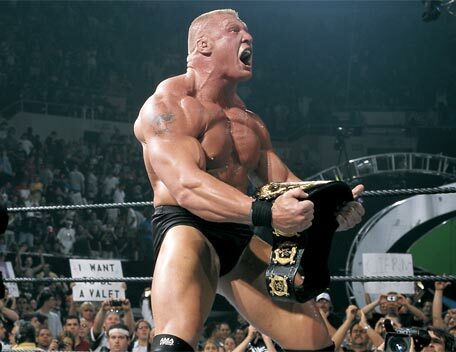 Brock Lesnar was one of the most dominant forces the WWE had ever seen. In his short 2 year career, Lesnar won the Royal Rumble, headlined Wrestlemania 19 and became the youngest world champion in history. He owns pinfall victories over some of the biggest names the industry has ever seen, including The Rock, Hulk Hogan, Ric Flair and the Undertaker. The company had a lot invested in Lesnar before he decided to leave at Wrestlemania 20 to pursue a career in Football, which didn’t lead anywhere. The thing about the professional wrestling business though is that if you can draw money, you will always have a place on the card. Even though Lesnar ends his fighting career on a 2 fight losing streak, he is still a huge name and would be a major coup for World Wrestling Entertainment if Vince McMahon could sign him. 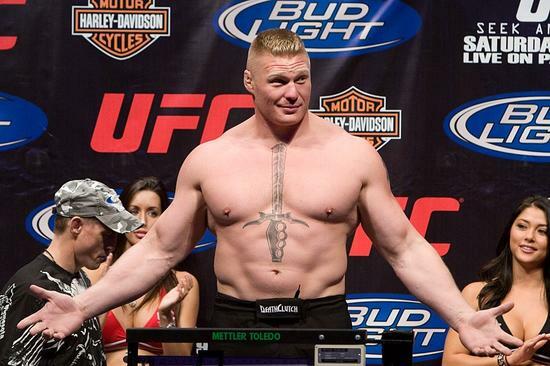 I fully expect Brock Lesnar back in a wrestling ring sometime in 2012. His physical restrictions due to his illness will prevent him from returning to a full-time schedule, but a couple of matches here and there seem more than likely for Lesnar. Besides, even if he was fully healthy, I don’t think Lesnar wants to return to wrestling full-time anyways. The long road trips, constant recognition and time away from his family were some of the reasons why Lesnar wanted out of wrestling in the first place. I do believe though that he has the fire within him and the competitive spirit to see if he can still compete with the stars of today. Or perhaps the stars of yesterday…. There is real-life animosity between both Mark Calloway and Brock Lesnar that is definitely apparent now after watching the Ariel Helwani/Undertaker interview at UFC 121. I’m pretty sure Vince McMahon has seen it as well and would be very interested in getting these 2 in the ring together, possibly as soon as Wrestlemania 29. A big-time event like Wrestlemania would be the perfect event to bring Lesnar back. The WWE would have to treat Lesnar’s comeback similar to the way they did with guys like The Rock and Chris Jericho. Promote the hell out of his return and milk it for all the high buy-rates and revenue sales you can. Extra precautions would have to be taken in the ring to ensure Lesnar’s health isn’t in danger though, but with the kind of payday a Wrestlemania can bring you, I would think Brock would jump at that opportunity. Just don’t be expecting Brock back in the WWE soon, especially as soon as Wrestlemania 28. Lesnar still has to work out an agreement with Dana White to let him out of the remaining obligations of his contract. I also think it’s in Brock’s best interest to take time off from training and fighting so that he can relax and get his strength back. With the Rock being the main focal point of Wrestlemania 27-28, perhaps “The Next Big Thing” will be at the forefront of Wrestlemania 29. Only time will tell. What do you think? Should Brock Lesnar return to the WWE? Would a Lesnar match at Wrestlemania intrigue you? Leave a comment below and let me know what you think! This entry was posted in UFC, WWE and tagged Alistair Overeem, Brock Lesnar, ESPN, Lesnar Retires, The Undertaker, UFC, UFC 141, Wrestlemania, Wrestling, WWE. Bookmark the permalink.